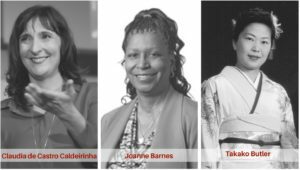 This panel provides a dialogue on (i) women’s authentic leadership in different countries/regions; (ii) how this authenticity can be used to make progress across cultural barriers, and (iii) open space for women’s access to and effectiveness as leaders. As some women see success in support roles, they are often called upon to follow the leadership behaviors of the organization and its male leaders. However, recent studies have shown that “it’s time for a new style of leadership, for businesses to move away from the traditional ‘alpha male’ approach” (Grant Thorton, 2016, p. 14). Today’s VUCA (volatile, unpredictable, complex and ambiguous) world and the pace of change are inviting leaders to move towards a leadership that emphasizes building the leader’s legitimacy through genuine and honest relationships and the respect of ethical foundations. Caldeirinha, C., & Hoerst, C. (2017). Women Leading the Way in Brussels. John Harper Publishing. become leaders. Boston, MA: Harvard Business School Press. Hopkins, M. M., & O’Neil, D. A. (2015). Authentic leadership: Application to women leaders. Frontiers in Psychology, 6(959). Kameda, N. (2014). Japanese business discourse of oneness: A personal perspective. Journal of Business Communication, 51(1), 93–113. Kanski, A. (2 June 2017). Women PR execs. Roibu, I. & Roibu., P. (2016). Women empowerment in Japan: policies and public’s reaction. Bulletin of The Transilvania University of Brasov, Series IV: Philology & Cultural Studies, 9(58-2), 133-140.
psychology across cultures: Engaging with others in a changing world (2nd ed.) [Kindleversion]. Thousand Oaks, CA: Sage.